Such upscaling is not necessarily all a bad thing. 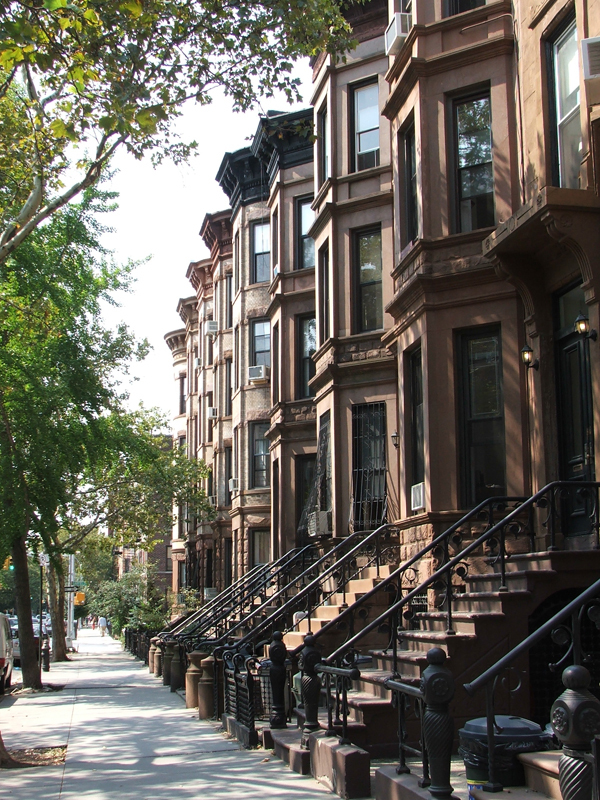 Park Slope, Williamsburg, Crown Heights, Flatbush, and a dozen other Brooklyn neighborhoods, once dens of decidedly dark-side dealings, are today as safe as pie – “sanitized for your protection,” as a friend says. And then there is the accompanying transformation of the culinary scene. These days in Manhattan, one must sift through a thousand versions of Bubba Gump Shrimp and Johnny Rockets before stumbling upon an authentic pizza joint. Meanwhile, Brooklyn is emerging as the new culinary capital of New York, boasting near-Michelin quality on a block-by-block basis. A stroll through Park Slope and its well-scrubbed surroundings leaves no doubt that you now need some serious coin if you hope to live there, even in an 800-square-foot third-floor walk-up. Not unlike Chelsea or Greenwich Village, raising a kid in Brooklyn these days is like growing an oak tree in a thimble. And there’s the rub. I’m no expert, but even an amateur like me knows there are two sides to the gentrification story, one of which never gets told. While Brooklyn looks great and tastes even better, Newton’s third law of motion cannot be avoided: for every action, there is an equal and opposite reaction. In the case of gentrification, of course – be it in Brooklyn, Barcelona, or Bakersfield – what that means is that poor folks just got their ticket punched for somewhere cheaper. Somewhere else. Somewhere gone. And with them goes a certain authenticity. Sure, Pok Pok is great, but who eats like that every night? Answer: the unbelievably rich. Pondering the gentrification phenomenon and its culinary implications upon my recent tour, I realized this is a complicated topic. Face it: you can’t swing a dead cat without smacking into a comfort food that has been foodie-fied to its precious and expensive extreme. Exhibit One is the upscaling of dishes like macaroni and cheese. Here is a dish that has seen the full spectrum, from Kraft’s industrialized elbow mac and powdered cheez to featured entrée dishes that incorporate lobster, $30-per-pound cheeses, and artisanal pasta. You can get a gentrified version of mac and cheese at any of the most envelope-pushing establishments. Go for it, Chef Grant Achatz. Either end of this spectrum draws serious suspicion. Simply put, I am not going to eat a dish that includes what can only be described as pulverized cheese product. Using the term “cheese” in reference to Kraft’s industrialized, boxed concoction ought to be illegal. While there are not many dishes that include lobster that I will not eat with an eager appetite, even pretentious eaters like me realize there is a cucina line in the sand that should and must be drawn. Not that I am unwilling to push that boundary. The other night, I had a hankering for a simple roast chicken, which I stuffed with mirepoix and scorched in a 500-degree oven to crisp the skin and sear in the juices. But I could not let well enough alone. Upon reflection (and because of boredom), it seemed clear to me that such a dish required Yukon Gold potatoes mashed with cream and mixed with butter-and-garlic-sautéed chanterelle mushrooms. Look, you gotta live a little. Still, a balance must be struck, whether in the neighborhoods of Brooklyn or your Own Private Kitchen. A recent example, which for me serves as a symbol of culinary balance, was a gentrified version of the Upper Midwest’s classic green bean hot dish (that’s “casserole” to those of you inhabiting states other than Minnesota, the Dakotas, Iowa, or Wisconsin). The green bean hot dish I grew up with was a staple at Lutheran church potlucks (believe me, neither “pot” nor “luck” was involved at these gatherings) and at holiday gatherings with my three-dozen cousins, uncles, and aunts. This is a dish that mainly requires a can opener. Open two cans of “French–cut” green beans and one can of cream of mushroom soup. Mix together and top with crispy onions. Cook until hot. Done and done. Blech. Blech, that is, unless you are open to a little gentrification. The other day, my wife brought home a three-pound package of fresh haricots verts, found on sale at the local market. Never mind that there are but two of us in the household eating green beans at present (our Labrador, Roy, will not touch veggies). The haricots were on serious sale, and our adopted household motto, “Save by spending,” held the day. I was pondering the existential question of what to do with such bounty when lightning struck. Green bean hot dish! I had the gorgeous fresh beans, but my quandary was how to upscale the cream of mushroom binder. The solution, courtesy of gentrification: I replaced the condensed industrial Campbell’s product with a simple béchamel, augmented with recently procured farmers’ market leeks, garlic, and a handful of chanterelle nuggets (cheap this year due to a bumper crop), which resulted in a dish of humble yet epic proportions. Dang, it was good. OK, the Truth in Recipe Act requires full disclosure: I also added two tablespoons of tiny chunks of Prosciutto di Parma and some lovely shredded Gruyère . . . like it needed to be richer. The result was the culinary equivalent of a $3000-per-month two-bedroom Park Slope brownstone. Whether you are buying $500 turbo-strollers, $30 lobster mac and cheese entrées, or $200 tickets for front-row seats to a revival of Supertramp, it’s easy to let a surfeit of money get the best of you. The trick is to live sufficiently high on the hog without spending an arm and a leg or selling your soul (to mix a couple of perfectly good metaphors) in the process. As with life, it takes a little imagination. But it can be done. Blanch the green beans for two minutes in boiling water. Submerge in ice water to stop cooking. Set aside. To make the béchamel, sauté the garlic and leeks in butter until softened. Add flour and sauté for three to four minutes. Add milk slowly and whisk until the mixture is thickened. Add the béchamel to the green beans and mushrooms and season expertly with salt and pepper. Place in an oven-proof hot dish. Sprinkle with grated Gruyère cheese. Top with mixture of panko and chopped parsley. Cook for 45 minutes, covered by tinfoil or casserole top, in an oven pre-heated to 375 degrees. This would be a great Thanksgiving side. Or, I would serve it any other day with a plainly grilled steak, veal, or pork chops.